Oh, the good old lace! Personally it is one of the thing I always, always look for when I’m thrifting or browsing a charity shop. Maybe you’re wondering what’s to love in some dusty yellowed lace. Well, it’s the magic in it: the stories it tells, the smell of the past and, of course, its infinite crafty potential! See, that’s the thing with old lace: you can use it in multiple ways and out of it you can make so many different objects or accessories which will bring that lovely vintage chic twist to your house and wardrobe. Look at these beautiful projects that I found for you on CountryLLiving. 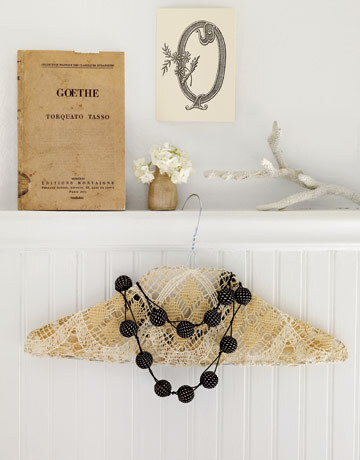 For your house, this delicate vintage-looking hanger. You just need to wrap it with an old doily then hang it somewhere to create a shabby corner. 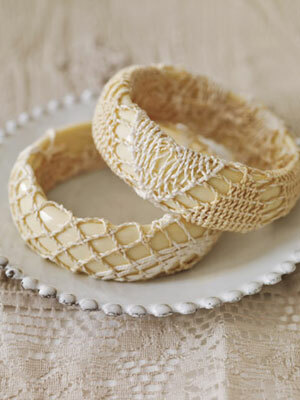 For yourself, these lovely bangles to sport for a boho-chic look. See? Super easy and the results are adorable!